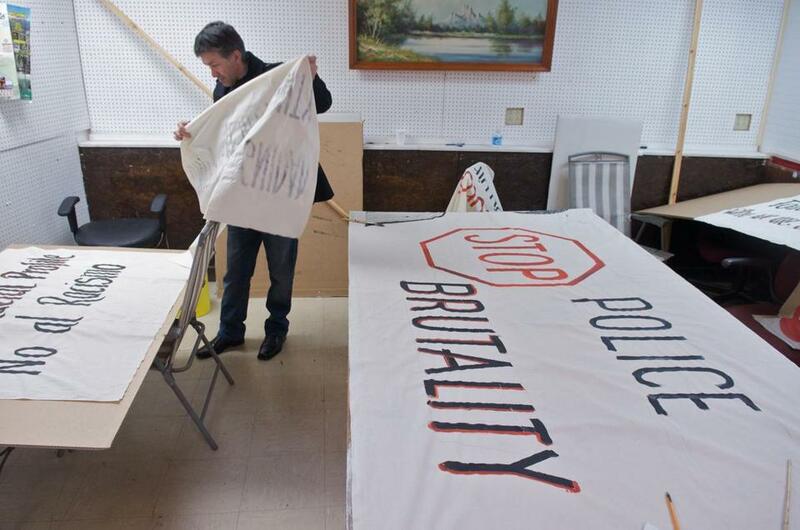 Amid a police harassment case, Herman Zuñiga helped prepare signs for a rally tomorrow in East Haven, Conn.
EAST HAVEN, Conn. - Federal immigration officials activated the controversial crime-fighting program known as Secure Communities across Connecticut this week, stunning this city just weeks after the FBI arrested four police officers on charges of harassing immigrants and Latinos. Like Governor Deval Patrick, Governor Dannel Malloy of Connecticut last year sought to delay Secure Communities on concerns that the program - designed primarily to catch and deport criminals - is also deporting high numbers of immigrants who have not been convicted of any crime. In Massachusetts, only Boston participates in the program after helping to pilot it in 2006, but officials at US Immigration and Customs Enforcement - known as ICE - say the program will be nationwide by the end of 2013. The program also went statewide in Maryland and New Jersey this week. Others praised the program this week for rooting out dangerous criminals - including more than 45,000 serious offenders such as rapists and murderers - and finding people who do not have legal authorization to live in the United States.